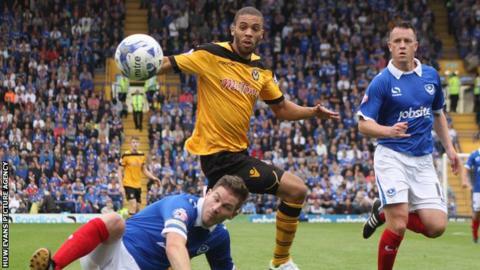 Christian Jolley spent a successful loan spell at Newport before joining in a permanent deal in January 2013. Newport County have transfer-listed goalkeeper Lenny Pidgeley and strikers Danny Crow and Christian Jolley. Manager Justin Edinburgh says the League Two side need to free up funds to strengthen their squad in other areas. The former Spurs defender admitted the decision to let all three go was a tough one. "It's tough but they're the decisions you're called upon to make as a manager. I've made them, I stick by them, but with a heavy heart." All three played major roles in County's successful promotion from the Conference in 2013, with Jolley scoring the opening goal in their play-off final win at Wembley against Wrexham. Jolley, signed from AFC Wimbledon in January 2013, spent a two-month loan spell at Conference side Forest Green this season while former Peterborough United player Crow has made only two appearances for the Exiles during the current campaign. Pidgeley's opportunities have been limited to four league appearances this season and County also have Jamie Stephens and Joe Day on their books. County completed the record signing of Day from Peterborough in time for Saturday's game against Carlisle United. "Lenny knows that Jamie [Stephens] and Joe [Day] are first and second choice, and that he's become available for loan and permanent transfer," Edinburgh added. "They're the horrible parts of being a manager because Lenny's been fantastic in his time here but unfortunately sometimes some things come to an end." Edinburgh says the club are also looking to sign a defender during the January transfer window after Andrew Hughes sustained a serious knee injury. But Edinburgh hinted it may not be former Cardiff City and Crystal Palace player Darcy Blake who continues to train with the Exiles. The Wales international needs to improve his fitness levels having not played a league game since leaving the club at the end of last season. "Really we need to find out if Darcy still wants to do it," Edinburgh said. "Finances will be discussed but for Darcy it's got to be whether he's still really in love with football. "You've got to want to be a footballer, I'm not saying he isn't. It's just whether or not that burning desire is in him, you've just got to have it. Time will tell."